Nutrient Rich Canned Milk Cause obesity in babies\children. Research. A UK study reveals that those children who are given canned and formula milk from 5 to 8 year of age are at high risk of developing obesity. Researchers added that These children not only get the extra weight but they also become prone to hypertension, Diabetes and heart problems in their later lives. A careful estimation by scientists reveals that children on formula milk diet gain 22 - 38 per cent more weight than the children who take the normal natural diet. In view of the above information, it is clear that obesity may occur in children as well. Formula milk and unnatural diet is the major culprit behind this issue. 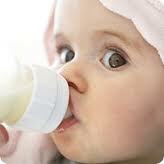 Therefore, children should be made to eat a natural diet instead of artificial formula milk. Yes,Now a days,most of people are using canned milk for babies.I think they should read this kind of article and take care their babies.I ll recommend this blog post to my all friends so that they can also have a look on this article. Thanks for sharing a very nice and helpful article with us. thanks a lot for you appreciation. it means lot to us. educating people is the best way to prevent diseases.